The dental laboratory makes a mold or model of your jaw, places the teeth in a wax base, and carves the wax to the exact form wanted in the finished denture. Usually a "wax try-in" of the denture will be done at the dentist`s office so any adjustments can be done before the denture is completed. The denture is completed at the dental laboratory using the "lost wax" technique. A mold of the wax-up denture is made, the wax is removed and the remaining space is filled with pink plastic in dough form. The mold is then heated to harden the plastic. The denture is then polished and ready for wear. At first, you may be asked to wear your denture all the time. Although this may be temporarily uncomfortable, it is the quickest way to identify those denture parts that may need adjustment. If the denture puts too much pressure on a particular area, that spot will become sore. Your denture can be adjusted to fit more comfortably. After making adjustments, you may need to take the denture out of your mouth before going to bed and replace it in the morning. Start out by eating soft foods that are cut into small pieces. Chew on both sides of the mouth to keep even pressure on the denture. Avoid sticky or hard foods, including gum. 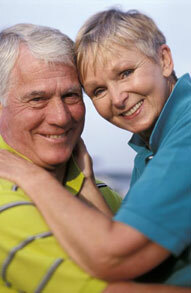 For more information on Dentures in the Rocklin, CA area call Rocklin Dental Whispers at (916) 663-5675 today!